There is an infinite amount of recipes on the internet, but not many are as synonymous with cycling as the one for rice cakes. It’s always a good idea to seek inspiration among those who enjoy the same lifestyle as you, meaning they love cycling. There are so many cyclists who regularly use and love rice cakes that it can’t be assigned to just one. But one person stands out as the most qualified to make them. Chris Froome considers rice cakes his secret weapon and, after close examination, it seems it’s pretty much the whole Team Sky that enjoys them. And there might be one man that’s responsible for that – the head chef for Team Sky, Henrik Orre. 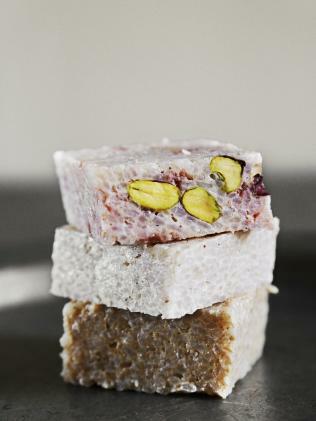 This recipe comes from a book called Vélochef by Team Sky’s head chef Henrik Orre. It’s an iconic cycling snack designed to give riders plenty of easy-to-digest energy. It’s full of complex and simple carbs as you would expect. But it became popular because it’s a solid, crunchy, and tasty food that can replace energy bars. Riders learn to love them when a thought of another gooey gel and the samey bar is repulsive. This recipe yields approximately 20 cakes, give it a try. Enjoy! 1. Use a rice cooker if you have one. Boil the rice, water, coconut oil, cinnamon and coconut sugar. Let it boil until all of the water has been absorbed. 2. Fold the cream cheese into the rice while it’s still warm. 3. Mix in the agave nectar and blend thoroughly. 4. Pour into a three-litre plastic bag with a zip lock. Flatten the bag and leave in the fridge overnight. 5. Take the bag out of the fridge and cut the rice mix into 5cm x 5cm squares. Wrap the squares in aluminium foil. 6. Add pistachios or other nuts to add variety. Vuelta 2017 Is Here, Who’s Going to Win?